Soviet partisans were active in the Narocz forest from the beginning of 1942. The leader of the first organised partisan group in the area was Fiodor Markow. At the beginning of 1943 a military Lithuanian group led by Zimnas (pseudonym: Yurgis) and Schumakus (pseudonym: Kazimir) arrived in the Narocz region. Kazimir was responsible for the Narocz region and Yurgis was supposed to establish a partisan base in the Rudniki forest. There were hundreds of Jews, including women and children, in the Narocz forest. Some of the younger ones were accepted into partisan units and others were rejected. Their situation was difficult and they suffered from a shortage of food, from harassment by non-Jewish partisans and from German forays into the forest. Even those who were accepted into partisan units suffered from antisemitism and discrimination. We stood once again in formation … Sidyakin informed us that the time had come to go into action as real partisans… The group would obtain weapons from the local population… The weapons of the group, Sidyakin determined, would be two rifles. The rest of the group's weapons, three pistols, were taken from them for established partisans in Otriad (the partisan unit) that did not yet have weapons… The weapons that we were to obtain on this mission would remain in their hands and with it they would fight the enemy… We stood silently as we heard the orders… I felt a burning injustice, as I'm sure did the rest of my friends. The commander had discriminated against us because we were Jews. Soldiers that had escaped from captivity and locals who joined the partisans unarmed were not sent to obtain weapons, rather the Otriad provided for them. The first group of 21 FPO members left the ghetto led by Glazman a few days before the Wittenberg affair. On the way to the forest they fell into a German ambush and nine of their members were killed. The others succeeded, following hardships, in reaching Markov's brigade. Glazman succeeded in convincing Markov to form a Jewish partisan unit within the framework of his own unit "Mstitel" (revenge). The brigade absorbed the members of the FPO who left the ghetto on the 8th – 13th of September 1943 and numbered about 250 people. When the Germans began a manhunt in Narocz, the group disbanded and the members split into smaller units. Glazman, together with 35 fighters, half of them FPO and half locals, received additional weapons from Yurgis and they were required to force a path to the Kazan forest. The manhunt was extended to Kazan and on the 7th of October, when Glazman and his fighters tried to return to Narocz they were surrounded by German forces and fell in battle. Only one young girl managed to escape and hid in the field. The winter of 1943 – 1944 was a positive turning point in the Jewish fighter's situation. The quantity of weapons increased due to a number of parachute drops from the Soviet Union. Even without weapons, Jews were increasingly accepted into some of the partisan units. Members of the FPO were absorbed into the units Ostrvil and Kalinin. 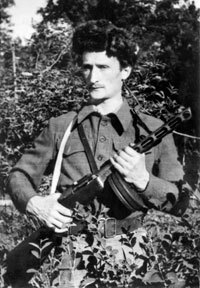 One group of FPO men, including Nissan Reznik, a member of the FPO Staff Command relocated to the Kazan forest and joined the Lithuanian Brigade Zalgiris. Many of the Jews distinguished themselves in battle. They took part in laying explosive mines for trains, attacks on Germans and ambushes and they fought together with units of the Red Army to liberate the area. Dozens of them were killed in battle.